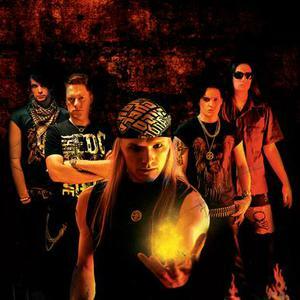 Firenote is a rock band from Finland with an attitude as big as a stadium. The band was formed in 2004 by Hammond and Ricky. The idea was to put together a band which would play hi-octane stadium rock in the good old 80's way, sounding larger than life. Firenote's first line-up was: Ricky - Vocals Hammond - Keyboard Isko - Guitar Gene - Bass Johnny - Drums With the line-up above Firenote made three demos and played several gigs across Finland. In the end of 2007 it was time to let Johnny go. As soon as Mike was found, he replaced Johnny with his ultimate drumming skills. The idea was to put together a band which would play hi-octane stadium rock in the good old 80's way, sounding larger than life. With the line-up above Firenote made three demos and played several gigs across Finland. In the end of 2007 it was time to let Johnny go. As soon as Mike was found, he replaced Johnny with his ultimate drumming skills. At the beginning of 2008 IVK Music was interested in signing Firenote. A record deal was signed in the summer 2008. Recording the debute album started in the end of 2008 and the album will be released in May 2009.